The Albright Visitor Center and Museum, located next to Mammoth Hot Springs, is perhaps one of the park's best known man-made attractions. The original site of a 19th-century U.S. Cavalry post that had been erected in the late 1800s to protect the park from vandalism and theft, the visitor center and surrounding buildings tell the story of Yellowstone's early history, from its designation as the country's first national park in 1872, to the creation of the National Park Service in 1916, when the post was decommissioned. Still referred to euphemistically as "Fort Yellowstone," the sandstone buildings included the complete living quarters for officers and enlisted men, including a bachelor officer's quarters (now the actual visitor center), horse stables, a chapel and barracks for 200 soldiers. By 1910 more than 300 men were housed throughout the park for the purpose of protecting its natural resources. The stately buildings now house a visitor center and museum with four primary exhibits, including the Moran Gallery, which houses the watercolor sketches of explorer Thomas Moran and the Jackson Gallery, which includes photographs by William Henry Jackson There is also an audiovisual presentation located in the visitor center. The Park Service also holds popular school-related and summer educational programs on site, which is within walking distance of Mammoth Hot Springs and adjoining self-guided trails. Beginning in 2007 or 2008, NPS will be doing earthquake reinforcement to the building. The museum exhibits will continue to be open to the public during this period. The complex serves as the visitor center for the northwest end of the park, which is known for its thermal features and limestone terraces. 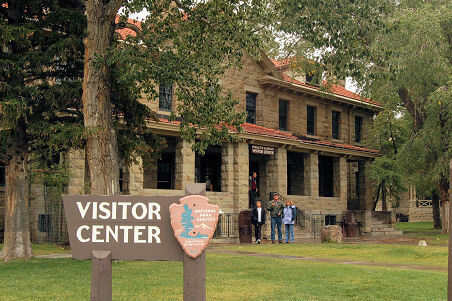 The visitor center is open 365 days a year and is located five miles inside the North Entrance. Back country permits, fishing and boating permits can be obtained on site during the summer months.